Russian-born Valery Rodion holds a master degree in Sports Gymnastics, and participated in international gymnastics competitions before switching to the circus&madash;as many Russian gymnasts do when their competitive career comes to an end. He became a member of the Mikhhev Troupe, which has succeeded the legendary Russian Barre act of Nikolai Zemskov. This latter act, which had been staged by Valentin Gneushev and had won a Gold Medal at the Festival Mondial du Cirque de Demain in Paris in 1993, was in fact at the root of Valery Rodion’s act. After Nikolai Zemskov’s untimely and sudden death during the International Circus Festival of Monte Carlo in 1995, his act was taken over for some time by its remarkable flyerAn acrobat that is propelled in the air, either in a flying act, or in an acrobatic act (i.e. teeterboard)., Igor Boitsov. Then, when the Boitsov Troupe eventually dissolved, its principal catcherIn an acrobatic or a flying act, the person whose role is to catch acrobats that have been propelled in the air., Andrey Mikheev, decided to create a different act, albeit in keeping with the style created by Gneushev for the Zemskov Troupe. He already had Valery Rodion, who was the act’s second catcherIn an acrobatic or a flying act, the person whose role is to catch acrobats that have been propelled in the air., and a talented young flyerAn acrobat that is propelled in the air, either in a flying act, or in an acrobatic act (i.e. teeterboard)., Konstantin Gvodetsky. They began a search for a female flyerAn acrobat that is propelled in the air, either in a flying act, or in an acrobatic act (i.e. teeterboard). who could replicate or improve upon Boitsov’s style and work. While they were trying new flyers at Circus Nikulin, Valentin Gneushev observed from the wings. Gneushev gave his opinion, generally doubtful or frankly negative on each of the girls. Then he noticed Anna Gosudareva, a very talented former gymnastics European champion, and suggested her to Mikheev. The new act thus came to shape. The Mikheev Troupe troupe made its debut at Circus Nikulin, and then went on to perform in Europe and in Mexico. Valery Rodion eventually took over the leadership of the group, which became the Rodion Troupe. 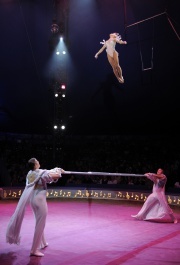 In 2005, the Rodion Troupe participated in the International Circus Festival of Monte Carlo, where Anna Gosudareva became the first woman ever to complete a quadruple somersault on the Russian Barre. This extraordinary feat, as well as the rest of her work, won the Rodions the Gold Clown award, the highest international honor in circus arts. The Rodion Troupe returned to Monte Carlo in 2006, invited to participate in the extraordinary star-studded circus gala organized in tribute to the late Prince Rainier III of Monaco—arguably one the most extraordinary and unforgettable circus show ever staged. The Rodions continued their international career and made their first American appearance in the Big Apple Circus production of Play On! in 2008. The act had then become a trio. Anna Gosudareva eventually retired from performing, and the subsequent Rodion Trio took a sharp departure from its original style, with a new male flyerAn acrobat that is propelled in the air, either in a flying act, or in an acrobatic act (i.e. teeterboard)., Zhong Zhiwei.